Each team member has a daily chore. 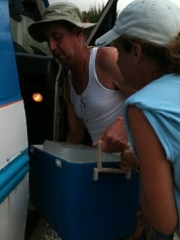 Robert, our bus driver, stops on the way to our house each day and buys a block of ice. Ken's job is to pack the sodas and Toro in ice. First he has to chop the ice, though. It's a very important job ... In the middle of a hot and tiring clinic there's nothing like a cold coke or Toro. Ken and Sharin have become Toro coverts... They went over to the "dark side".